The CRISPR-Cas system is a widespread prokaryotic defense system which targets and cleaves invasive nucleic acids, such as plasmids or viruses. So far, a great number of studies have focused on the components and mechanisms of this system, however, a direct visualization of CRISPR-Cas degrading invading DNA in real-time has not yet been studied at the single-cell level. 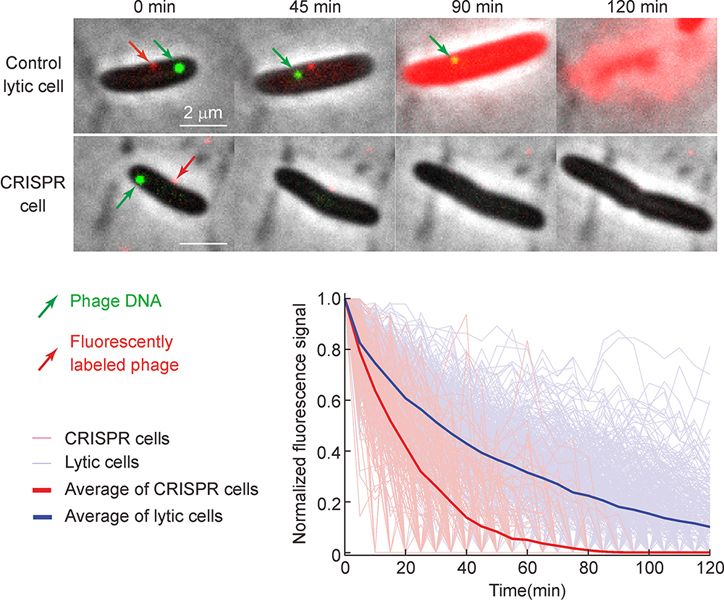 In this study, we fluorescently label phage lambda DNA in vivo, and track the labeled DNA over time to characterize DNA degradation at the single-cell level. At the bulk level, the lysogenization frequency of cells harboring CRISPR plasmids decreases significantly compared to cells with a non-CRISPR control. At the single-cell level, host cells with CRISPR activity are unperturbed by phage infection, maintaining normal growth like uninfected cells, where the efficiency of our anti-lambda CRISPR system is around 26%. During the course of time-lapse movies, the average fluorescence of invasive phage DNA in cells with CRISPR activity, decays more rapidly compared to cells without, and phage DNA is fully degraded by around 44 minutes on average. Moreover, the degradation appears to be independent of cell size or the phage DNA ejection site suggesting that Cas proteins are dispersed in sufficient quantities throughout the cell. With the CRISPR-Cas visualization system we developed, we are able to examine and characterize how a CRISPR system degrades invading phage DNA at the single-cell level. This work provides direct evidence and improves the current understanding on how CRISPR breaks down invading DNA. 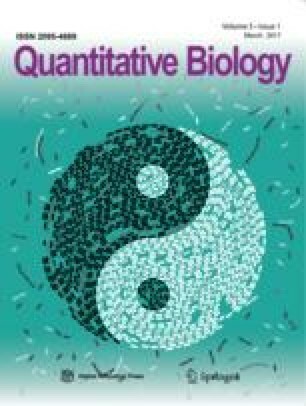 This article is dedicated to the Special Collection of Synthetic Biology, Aiming for Quantitative Control of Cellular Systems (Eds. Cheemeng Tan and Haiyan Liu). The supplementary materials can be found online with this article at DOI 10.1007/s40484-017-0099-0. We are grateful to Rodem Edgar for providing the CRISPR plasmids. We would like to thank all members of the Zeng laboratory for help with the experiments and data analysis. Work in the Zeng laboratory was supported by the National Institutes of Health (R01GM107597). The funder had no role in study design, data collection and interpretation, or the decision to submit the work for publication. Supplementary material, approximately 263 KB. Supplementary material, approximately 244 KB. Supplementary material, approximately 312 KB. Supplementary material, approximately 782 KB. Supplementary material, approximately 623 KB. Supplementary material, approximately 643 KB. Supplementary material, approximately 304 KB.